Pediatric Chiropractic is a specialized chiropractic adjustment designed specifically for the unique needs of children, babies and newborns. As the nervous system controls all function in the body, it’s important for children as young as a day old to get off to a great start in life by optimizing that function. Research shows that 80% of all normal births include some damage to the upper neck of the baby. That’s why it’s vital to have kids checked as soon as possible to avoid some of the common problems that children suffer from as they go through the developmental stages of growth. What Conditions Respond Well to Chiropractic Care? Our treatment is always tailored to the size of the patient, meaning that the adjustment is as big as the person! For newborns and babies, the force used for a spinal correction is like the mild pressure used to check a tomato’s ripeness or the gentle touch of a fingertip on an eyeball. We have a favorite practice member who first came to see us when he was 9 years old. He was autistic, and his parents wanted to give chiropractic a try. One month after he started treatment, the family had to attend a wedding reception. They expected their son to behave as he always did — to stand in a corner by himself with his hands over his ears repeating various words. He surprised them, though, by actually dancing to the wedding music and playing with other kids. Another month went by, and his mom found that when she picked him up from school, rather than sitting by himself outside, he was interacting with other children. It’s been a year now since he started receiving chiropractic adjustments and he’s not only learned how to water ski without any disruption but is also on a soccer team and plays flag football. Pediatric chiropractic helped to normalize the functioning of his nervous system, and he consequently manifested change in the form of physical vitality, better social interaction and improved emotional health. Dr. Chad is a certified Webster practitioner. The Webster Technique not only helps moms to experience an optimal pregnancy but also assists the newborn in having a safe and smooth entry into the world. Dr. Chad is an EPIC practitioner and a member of the International Chiropractic Pediatric Association (ICPA). These groups champion the unique health needs of children through noninvasive treatment protocols, including chiropractic treatment, exercise and nutrition. He’s also had extensive training in ADHD. We respect the intuitive sense that every mom has about her child. If your baby is only having a bowel movement every four days and is crying the other three, moms know that it’s not okay, even when her physician says it is. We listen and collaborate with you in optimizing your child’s health. We know that sometimes it’s difficult and stressful to bring little ones to a doctor’s office. In response to this, we make it easy to be a kid in our clinic. We offer a large play area for children to run around in, and also provide a private room for parents to feed and change the baby. 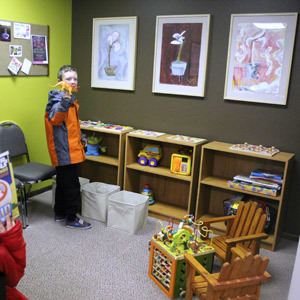 Children respond quickly and efficiently to our precise adjustment protocols. If your child is suffering from any physical or emotional issues, we may be able to help. Why not give chiropractic a try? Contact us now for a same-day appointment; we’re open late and even have emergency hours!